How can I view details on what QODBC is performing in the background? 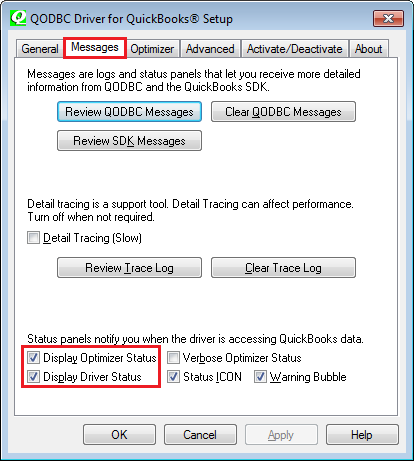 Navigate to "Message" tab ->Select "Display Driver Status" and "Display optimizer Status" options. Then the next time you run a query, if you see “Waiting for QuickBooks”, It means QuickBooks is taking time to process the request. 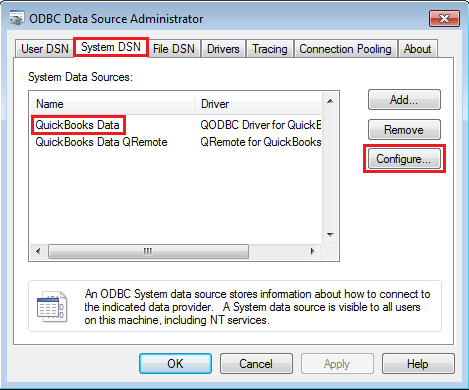 Please note the step on which QODBC spends most time or get stuck and share it with us. Is there any way to turn the Driver Status Panels dynamically? That is, to use something like a batch file, vbs, or similar to do this so a user does not have to. Or a way to enable the Panels as default? No, There is no way to change it programmatically. I would like to share that Messages Tab settings are stored in ODBCINST.INI file. To enable Driver Status Panels. You can add below line in ODBCINST.INI file. Thank you! 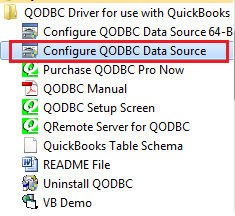 By instructing my clients to use the default installation the QODBC uses I can now utilize code within my applications that checks this file and adds/change the DebugPanel to equal Yes. One less issue that I will have to contend with when creating applications I build that would otherwise require user actions and/or instructions.